So what do you get an old-school video gamer who’s got just about everything? How about his own personal arcade machine stocked to the gills with classic arcade games? That’s what Costco has on offer with their Arcade Legends unit. Available both in a cocktail table (top picture) or an upright cabinet, there’s sure to be more than a few favorites among the list of titles. 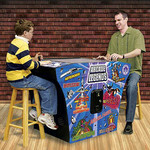 The Arcade Legends table game is made by one of the oldest and most respected manufacturers in the coin op game business. It’s the real thing, except the coin door is permanently deactivated: play for free! 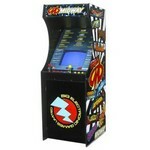 It plays 50 of the most popular arcade games of all time, made famous by Atari, Capcom and Universal. Features legendary arcade games, authentic in every detail, including Asteroids, Battlezone, Berzerk, Centipede, Millipede, Missile Command, Mortal Kombat, Mr. Do!, Street Fighter ll, Tempest, Mega Man, Super Breakout, 1942, 1941 and more. It ain’t cheap, though, as it’ll set you back a good $2,499.99, but at least shipping and handling is included in that price. If that’s a little rich for your blood then you could always check out what Target is offering with their Midway Home Use Arcade Machine (bottom picture). It only costs $500, but it only comes with the following 12 Midway titles: Joust, Defender I and II, Robotron, Rampage, Splat, Satan’s Hollow, Root Beer Tapper, Bubbles, Wizard of War, Timber and Sinistar. Plus it’s not really a full-size cabinet and for that kind of money you could just buy him a new Xbox 360 and look forward instead of behind. After all, if he’s truly a gaming geek who has everything then he’s probably already built himself a Mame Arcade Cabinet that uses an old PC to run all his favorite arcade classics via emulation. Still, if you’re curious, there’s a full game list for the Arcade Legends unit in the extended entry. More than one of my old favorites in that list. Wouldn’t be a horrible thing to find under the Christmas tree. Or next to it. Whatever. This entry was posted in Entertainment, Video Games and tagged Video Games by Les. Bookmark the permalink. Target has something similar for 450. The Arcade Legends 2 is a better game. 125 games for $2699 delivered. Plus you can add even more to it if you want to. Only available from an authorized dealer who knows how to fix it, not a big box store.